A new micro cache to replace the previous cache, not too difficult to find. Located in a spectacular section of Central Park. USE STEALTH - muggles are everywhere! GPS signals are weak here but be patient the cache IS there and when in doubt read the clue! Thanks to gracepap for starting this fabulous cache in a popular location in Central Park. The cache was featured in the 2009 movie "Splinterheads" (See screen grab). 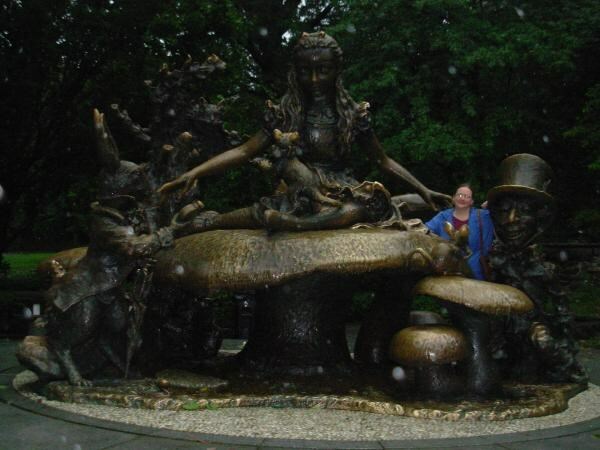 The cache is named in honor of the nearby "Alice in Wonderland" sculpture - a perennial favorite of children young and old. We adopted the cache in Feb 2008 when there were about 500 visits logged. So visits have dramatically grown since. The parks department finally took out the old lamp base where we had moved the cache. We found a new nearby hiding spot and downsized the cache so there is room for little else than the log and a pencil. The cache is a camoflaged old prescription pill container. This location is VERY busy so please use caution when retrieving and replacing. Be sure to rent a model sailboat if you have the time. Have fun! Gnxr n enoovg'f rlr ivrj. Checking on the cache in the rain! Frame from "Splinterheads"A frame grab from the 2009 movie "Splinterheads" in which the listing for "Down the Rabbit Hole" makes an appearance!